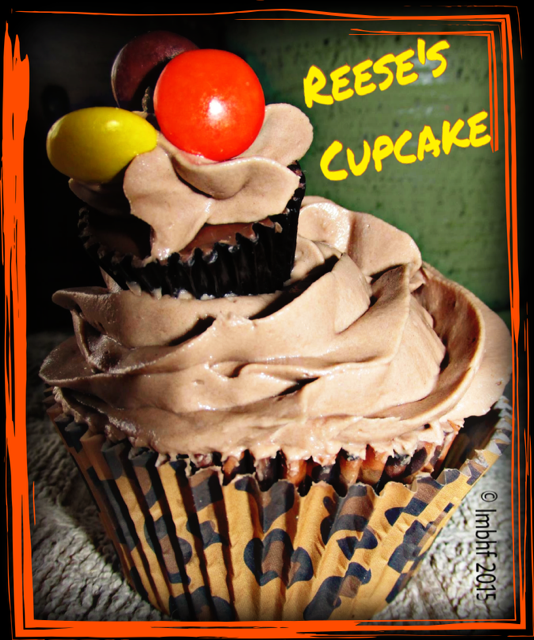 I have several peanut butter cup lovers in my family so I came up with this special cupcake variety just for them. Prepare cupcake batter according to package instructions. Remove the wrappers and place a large peanut butter cup into the bottom each of your cupcake liners. Fill liners 2/3 full with chocolate cupcake batter and bake according to package instructions. Allow cupcakes to cool. Prepare the frosting by mixing the butter, cream cheese, cocoa and vanilla until well blended. Alternately add the powdered sugar and mild until the frosting is thick and creamy. Pipe a generous amount of frosting onto the top of each cooled cupcake. Top the cupcake with a mini peanut butter cup (still in it’s wrapper). Top the mini peanut butter cup with a dollop of frosting. Finish your cupcake off by placing three Reese’s Pieces on top of the mini peanut butter cup. My mouth is watering just looking at the picture:) Wow…yummy. Kim, they are really delicious! What a fantastic idea! My daughter loves Reese PB. I will have to try to make these for her. I think the bite at the bottom would be tons of fun to eat. 🙂 Pinned! Thank you Heaven! I hope your daughter enjoys them! I have a daughter that loves Reese’s too.